May 27, 2016 – It’s History in Five Friday, presented by Simon & Schuster — check them out at Facebook.com/HistoryInFive. While it’s no secret that Abraham Lincoln didn’t have an idyllic childhood, today’s guest — journalist and political aide Sidney Blumenthal — noticed something in particular about young Lincoln’s experience that might have impacted the way he perceived and spoke about slavery. Blumenthal is the author of the book, A Self-Made Man: The Political Life of Abraham Lincoln, 1809-1849 . 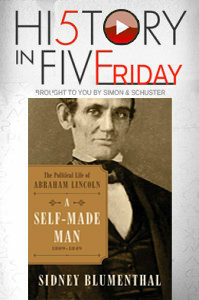 Simon & Schuster’s History in Five Friday. It’s the perfect way to kick off your modern weekend…with people, from the past.